Terroir: The appellation of Cotes du Roussillon is located in the heart of Frances sunny south with an abundance of warm Mediterranean sunshine and cooling winds from the sea. Hecht et Bannier source this selection from the villages of Tautavel, Estagel, Caramany, Espira de l’Agly and Lesquerde. 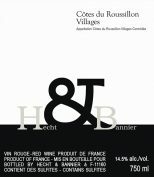 Vinification: The Cotes du Roussillon is a traditional blend of Grenache, Mourvedre, Carignan and Syrah vinified and aged in a combination of epoxy lined concrete tank, large neutral oak casks and about 20% in new oak barrels producing a wine of powerful, ripe, juicy fruit with an elegant, refined finish. Quickly accessible, the sensual, soft, round and smooth Grenache sides offer to us an immediate pleasure in mouth. Aromatically full, sapid and cheerful, our Côtes du Roussillon Villages shows a spicy and peppery side for a voluptuous wine, obvious. "A plush, medium-to-full-bodied red, with cherry tart and raspberry flavors detailed by anise, mocha and baking spice accents. Graphite and herb elements echo on the clean, lingering finish. Grenache, Syrah, Mourvèdre and Carignan. Drink now through 2023."